The more we find out about Taliban chief Mullah Akhtar Mansour the more mysterious he becomes. US and Afghan officials say Mansour was killed in a drone strike in Pakistan's Balochistan province. But a passport found at the scene belonged to one Wali Mohammad, the pseudonym he supposedly used in Pakistan. Every clue about his life and death seems to lead up a blind alley. Dawn newspaper provided a timeline of Wali Mohammad's travels. According to Dawn, he travelled to Dubai 19 times since 2006. Geo TV gave a lower figure. Some time ago Mansour set up businesses in Dubai, Afghan media reported, presumably with money made from the illegal drug trade when the Taliban were in power. Intriguingly, there were reportedly also at least two visits to Iran this year, on both occasions made via a border crossing in Balochistan. The drone struck on Saturday on the return leg of the latest trip. Reports of Mansour's travels to Iran have raised eyebrows in many quarters, given that Iranians, who are mostly Shia Muslims, are considered infidels by the Sunni Taliban. Iran denies Mansour ever travelled to the country. There has been speculation the Iranians wanted to back Taliban efforts to keep the more hard-line Islamic State out of Afghanistan. Others suspect that attempts to establish a Taliban-Iran connection may be to do with rising tensions between the Pakistani military and Iran. Much of Dawn's timeline of Mansour's - or Mohammad's - travels appears to have been gleaned from the passport that survived the deadly missile strike which turned his car into a lump of twisted metal. Strangely, the passport, and his Pakistani computerised ID, survived in impeccable condition - supposedly thrown clear somehow in the blast. There were no reports of anything else surviving in this fashion. Pictures of the passport and the ID were later circulated on social media and suggested that the dead man US President Barack Obama identified as Mullah Akhtar Mansour, an Afghan national, had actually been Pakistani national Wali Mohammad, a resident of Balochistan. The pictures of the passport and the Pakistani ID were first circulated on the WhatsApp account of a law enforcement agency based in Balochistan. This raised suspicions that it may be an attempt by the Pakistani security establishment to sow confusion. Many noted that both documents bore no marks of the deadly attack. Some even pointed out that these documents appeared to have been placed on a table to be photographed, which was unlikely given the claim that the pictures were taken at the site of the attack. The two documents provide permanent and current addresses of the holder. A search of a computerised database showed him to be a voter in the Qilla Abdullah area but a Geo TV reporter could find no one who knew him or the more than half a dozen children he had registered as his family. There was more evidence of the mystery man's presence in Karachi, even though the address he provided to the national data registration authority (Nadra) was incomplete. A BBC reporter in Karachi who went to the apartment met a man who said he was renting it and living there. He said he had never met the owner, and paid his monthly rent to a local estate agent. Other reporters who spoke to neighbours said that the owner used to come to the apartment building more frequently until 2010. After that his visits became fewer. They said he looked and dressed like an Afghan, and often came in an SUV, accompanied by a security detail of armed men who looked like Afghans. Many observers are of the view that, given the verification procedures of Nadra, a national ID with faulty or fake addresses could only be issued with official collusion. When asked if Nadra was conducting an investigation to verify the identity of Wali Mohammad, a Nadra official advised the BBC to "contact the interior ministry, because it is a sensitive matter". There is further confusion on whether the body is still in the hospital. The drone strike is said to have happened at around 3pm local time on Saturday. 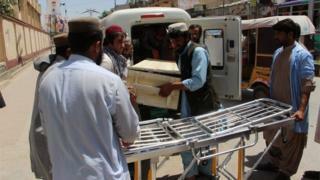 That evening, two dead bodies from the scene were deposited at a government hospital in Quetta. One body, that of a man named Azam who was believed to be the driver of the car, was immediately claimed by his relatives. The other lay there unclaimed. On Sunday evening, a hospital official told reporters in Quetta that someone who introduced himself as Mohammad Rafiq had rung up to say he was Wali Mohammad's nephew and would like to claim his body. But later he failed to show up at the hospital. On Monday evening, the home minister of Balochistan province told the BBC the body was still at the hospital. But on Tuesday morning a BBC reporter in Quetta was shown hospital records according to which the dead body of Wali Mohammad had been handed over to Mr Rafiq on Sunday. The reporter was also shown a handwritten receipt signed by Mr Rafiq. Below his signature, Mr Rafiq also provided his cell phone number, which is eight digits - one digit too long for Pakistan. Calls made using various combinations of the number have been fruitless so far.